Last Sunday, we celebrated Ayudha Pooja at our Kalari class. It is during this day that we revere the tools/weapons we use & also pray that they may be used carefully in all scenarios. 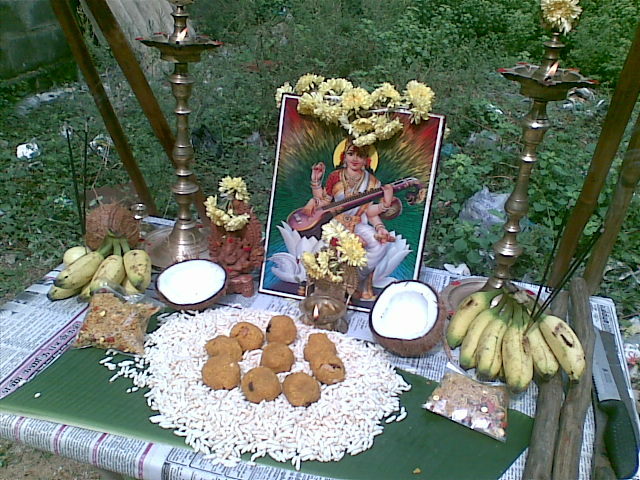 Shortly after the pooja was over, each of us had to do a sampler performance using the tools that we had kept in pooja. The sampler turned out to be an extempore one. So, we aren’t in the usual practice dress. Silambam is an integral part of Kalari. Using just a stick and rapid movements, a defender would be able to ward himself off various attack vectors and give them back a taste of their own medicine. My master performs a basic lesson that is taught to beginners in Silambam. The first 14 seconds of the video showcases the “Guru Vanakkam” or paying respects to the teacher before starting off. Watch closely. You will be able to hear the Whoooosh sound of the wind. That’s also the speed with which the Silambam is being rotated. Aruval is a sharp instrument that’s used to cut tree branches, tender coconuts and in some cases, heads of humans 😉 . In this video, my master is fighting with a senior student using a sharp aruval. Usually the edges are devoid of their sharpness during practice sessions. But this one was sharp & one has to be very careful when using these weapons. The video below is a 30 second teaser. Fighting with aruvals is taught after about a year and a half of continuous practice. Hope you enjoyed these videos 🙂 Let me know how you feel in the comments! It’s been about 8 months now & I’m still going to Kalari class regularly 😀 … Do you know how good it feels when you are doing something consistently and that your body is in pristine condition? 😉 No amount of blogging/reading will get the point across. You can only experience it by doing. So, just bend your head downwards & if you feel guilty at the huge lorry tyre around your tummy, you know what to do. Start exercising for 5 minutes a day and you will see magical results. You may also want to try out Steve’s 30 day trial method. It helps! So, coming back to topic … during the usual practice sessions we usually do plenty of stuff that involves heavy punching, kicking, diving (am less than an amateur in this) etc. On one such occassion two weeks ago, we were practicing a fighting routine with the help of a lathi. As part of the routine, the taller fighter throws the other one over the head. Since we are just learning, we make sure the diver lands safely. When we do dives, we take the help of our master. But, on that day, something else took over and I wanted to dive without the help of the master. So, when the tall guy picked me over his head and brought me down, I was slightly happy when I was in mid air, thinking that the landing would be nothing short of awesome! Landing I did .. but it was just the opposite of awesome. Instead of landing flat, both my feet hit the ground vertically. Since the foot is taking the whole body weight, it buckled under pressure and gave a CRACK! sound. Thankfully that was a twig. But both ankles got sprained badly enough that I couldn’t get up. Immediately one of the guys who has been learning Kalari for 3 years, came for help and did some techniques on my left feet. That released the pain but the strain was there. Same thing to the right leg too. Happily we continued the class. After getting home, it started. Searing pain through both my feet (left foot was slightly tolerable). There was no swelling but the pain was intense. I couldn’t even touch my leg. Then one of my physiotherapist friends came home and treated it back to perfection. I could walk again that day! 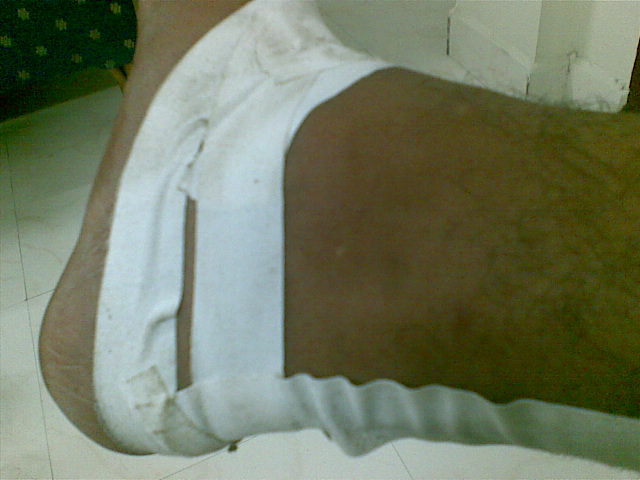 That’s how my ankle looked like. Phew! But I must say it was a worthy experience 😀 Absolutely loved it. Its been about 2 and a half months since I started going to the Kalari classes and I’m still going. Stamina has improved by a good extent and I’m able to note the difference between now and then. I have also started losing fear of sharp weapons such as daggers and vett aruvals. Overall, its been a very nice time every alternate morning for two hours at YMCA Nandanam. So, what’s been the main driving factor to get me to join Kalari apart from other fitness activities such as gym, yoga etc.? Yoga and gym are a few days activities at the teacher’s place, which means I have to practice it on my own afterwards. That requires tremendous mental toughness & moreover, altering your schedule to fit in yoga or gym in place of sleep is a tough. Hence, I needed something which would take a long time to master but at the same time I needed to learn the techniques fast enough. Kalari fit this bill easily. For full-time Kalari practitioners, it takes about 13 years to master it. For me, it will take even more, considering that fact that I practice it for just 6-10 hours a week. So, I can learn it for a decade slowly and surely. You also need a master at most times to correct you always. Many programmes disconnect you after the 10 day ritual. For e.g. in Kalari, you need to do a combination of punches, kicks and jumps. First you have to learn to do it. Then, you have to learn to do it well. Then, you have to improve your speed of doing it & fourthly, you have to perfect it & you need the master’s help in all these phases. Otherwise, it cannot be done. I have this tendency to ask lot of questions during the early days of learning something & I needed a master who will answer those patiently 🙂 Fortunately for me, the master under whom I’m learning now, is very patient and answers in detail about whatever questions I ask, even though they are stupid/silly for most of the time. I needed a flexible schedule. 10 day programmes are useless here. For a programme to be flexible, it has to happen over a period of time, so that you can always catch up. Here, we have flexible timings ;-). So, if I miss a class or two because of office or anything else, I can catch up during Saturday or Sunday. I needed a team. Jogging alone or doing yoga alone will seem awesome for a few days. But not for long. You will get bored soon. With Kalari, it doesn’t happen. Three of us (myself and 2 of my school friends) joined & every class is exciting. A fourth person joined & soon, we started practicing in groups of two. During weekends, we have a few experienced guys coming in, who have learned & practiced Kalari for 5-6 years. With them around, it will be awesome! There are actually lot more reasons for joining Kalari. But I won’t bore you with all that 🙂 so, if you wish to join, contact my master Kumar at +91-98418-97119. He will be able to help you. Usually people will have too much enthu in the initial days & then they will completely drop off. If you start Kalari and enjoy it, take it slowly. Try to reduce the enthu and ease it into your schedule. Then, it will stay with you for long. I will also try and post a few videos of myself and my friend fighting with bare hands and using a lathi. Kalari a.k.a Kalaripayattu is a form of traditional martial art that is believed to have originated in Kerala and then spread slowly across the world. Legend says it that, when Saint Parasurama (an incarnation of Lord Vishnu) threw the axe into the Arabian sea, the water receeded until the point of the axe and Kerala was born. To protect this land, Parasurama taught Kalari to 21 saints across the state who have been spreading their knowledge through dedicated disciples since then. There are essentially tons of other ways to keep yourself fit and this is one of those amazing pieces that very little people get to learn, very very few get to expertise level and even fewer become true masters. I found an interesting website when I was searching for Kalari videos. The website is http://www.kalari.in/. Go visit it and definitely check out their videos section. Its truly amazing!